50 CENT says he was impressed with Obama’s speech on race. (CNN) – Hillary Clinton appears to have lost a high-profile backer to rival Barack Obama. 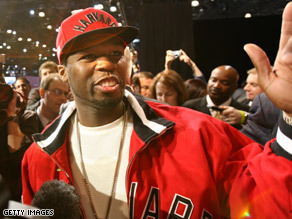 Rapper 50 Cent, who told Time magazine last September he was supporting the New York senator’s White House bid, now says he has decided to shift his allegiance to Obama. The multi-platinum star, born Curtis Jackson, told MTV News Friday that Obama’s recent speech on race was the deciding factor for his decision. But the musician also admitted he’s lost interest in the protracted Democratic race, and may not support either candidate. He also said he didn’t think the country is ready for a black president. ← 3AMgirl + Bosniagirl = Hillary liar, liar!